Checklists are mandatory data capture questions that force you to answer before being able to mark a report complete. Answers are Yes, No or N/A. Answering Yes or No will show an additional Comments box for typing any corresponding information. Questions marked N/A will not show on the completed report, where as items marked Yes or No will, along with the corresponding comments before the Rooms, Items and Conditions and after any preceding Notes and Disclaimers. 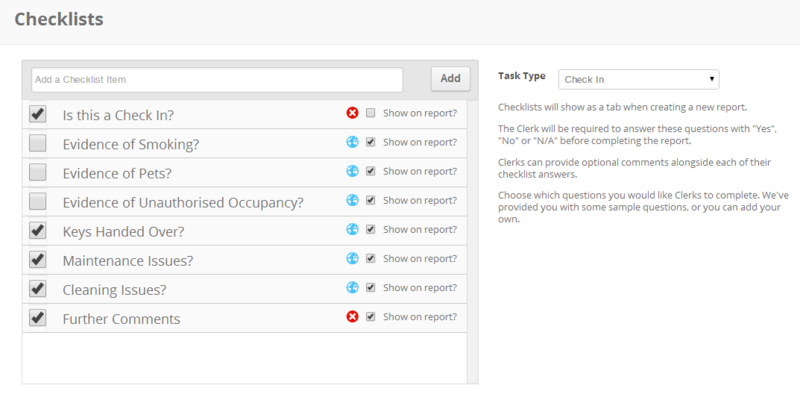 To view your default Checklist, click on the manage button and you will see a tab for Checklists. You can choose to check or uncheck and thus disable any of the default Checklist questions at any time, including your own. To add your own Checklist questions, simply type it into the Add a Checklist Item text field and click the Add button. You can choose whether these questions show on the completed report or not, which is useful for internal reminders/notes you need to capture. As well as turning off Checklist questions by unticking the box to the left of them, you can permanently delete ones you've added by clicking the Red X icon to the right. Be careful as this cannot be undone, and all current Active reports would no longer have this question in their Checklist, whether information was stored in it or not. Previously closed Inspections and reports, however, would still show the original Checklist details including all questions entered at the date that Inspection was conducted.